I have a confession to make. I have never ever cooked with blackened seasoning. I didn’t even know where to find it in the grocery store until I got the ingredients to make this recipe. And by the way, if you shop at Weis in Frederick, it’s right next to the seafood counter, duh! 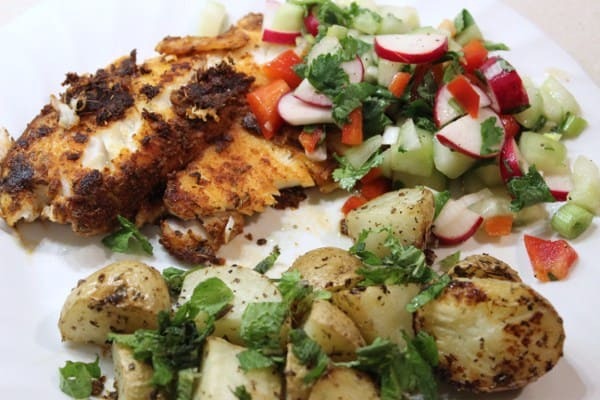 This recipe for Blackened Tilapia with Radish & Cucumber Salsa came right out of one of my Weight Watchers Weekly’s, the little pamphlet they give you when you attend meetings. 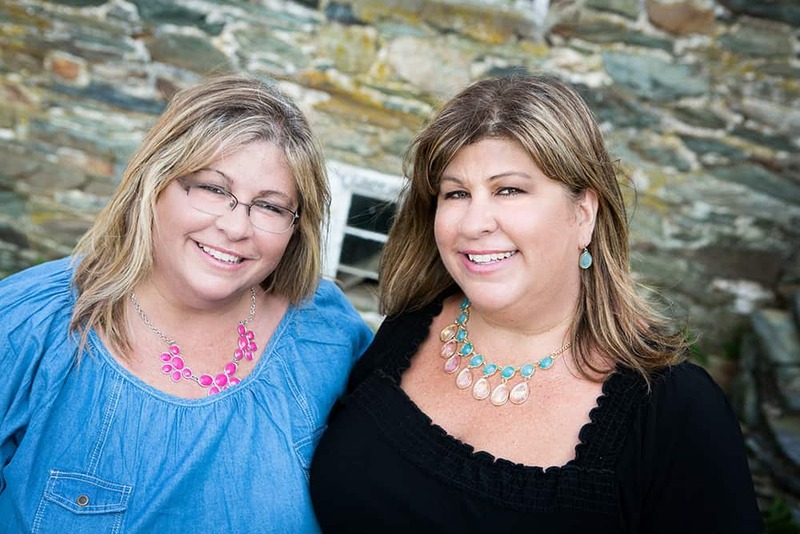 You can also find it on the Weight Watchers website HERE. 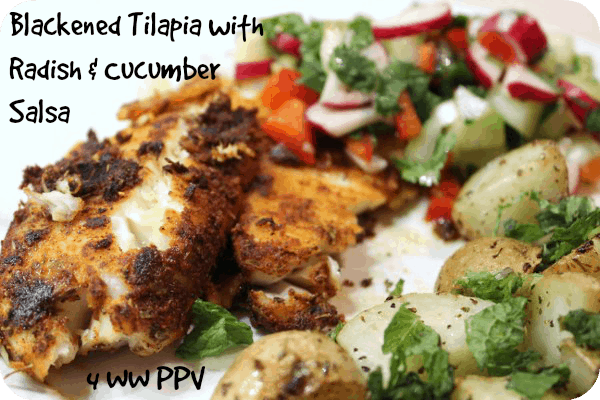 This recipe intrigued me because I love tilapia! It’s a white, flaky, mild fish. I usually bread it or broil it. My son and husband love it. 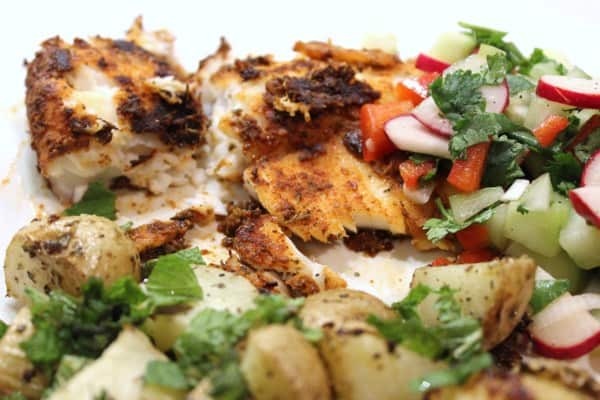 But I wanted to try something different than my typical tilapia dish. So when I found this recipe, I had to make it. Plus, the salsa that accompanies it looked amazing. Coat a large nonstick staute pan with cooking spray. Slice each radish in half and then thinly slice each half into half-moons. In a medium bowl, combine radishes, cucumber, red pepper, scallions, cilantro, lime juice, and oil. Season to taste with salt & pepper and serve over fish. The end result was SO good, but HOT, as in SPICY hot. Even my husband who usually likes to eat spicy things, was struggling through it. BUT, it really was delicious. My son even ate it. 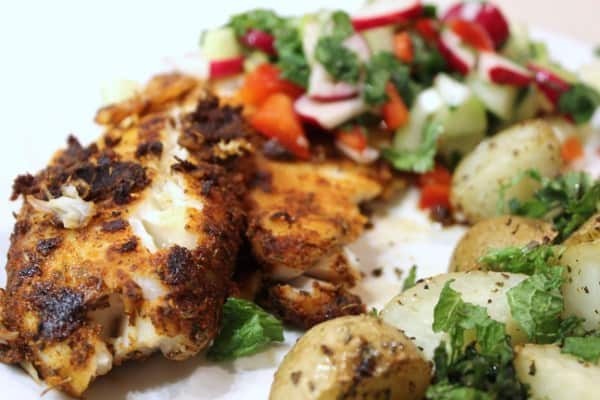 I had to slice the blackened edges off for him so he could just eat the white fish and not burn his tongue with the spice. The beauty of this recipe though is the salsa. 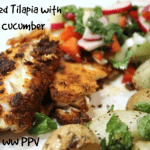 They included the salsa for a reason – to cool off the spiciness of the fish. The salsa was so refreshing. 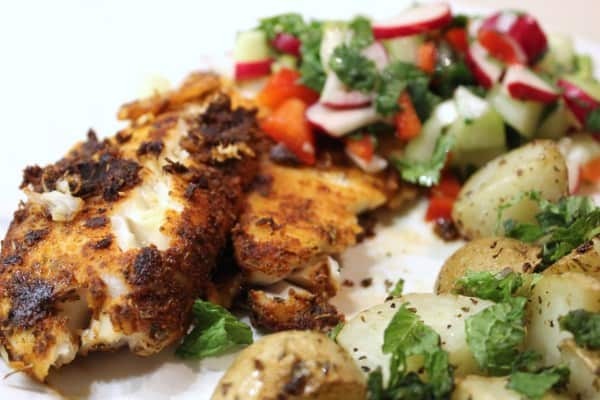 Even though there were radishes in it, which can also be spicy, it helped cool down the blackened seasoning on the tilapia. If you want to omit the radishes from the salsa, I won’t tell. I added another Weight Watchers recipe as the side dish: Roasted Baby Potatoes with Oregano & Lemon. This recipe will be in my next post. They were the perfect accompaniment to the fish and salsa. So if you’re not hugely into spicy dishes, but like to walk a tad bit on the wild side, decrease the blackened seasoning a little bit. It really gives it that nice crispy, tasty crust on the outside of the fish. AND, if you love spicy food and like to show off to all of your friends how tough you are, even though your face is drenched in sweat, add more blackened seasoning. Go ahead, I dare ya! That picture looks sooooo good! However, I will not be taking you up on your spicy challenge…I am a total wimp! I will cut back on the spice though and give it a try. Looks so yummy! Definitely try that Pam. I think you’ll love it without too much spice. I know I did. You gals are really making me hungry today!!! The pictures are fabulous!!! Dad will love this one for sure; he’ll probably add pepper!! Ha ha! That’s true Cheryl. Be careful though. 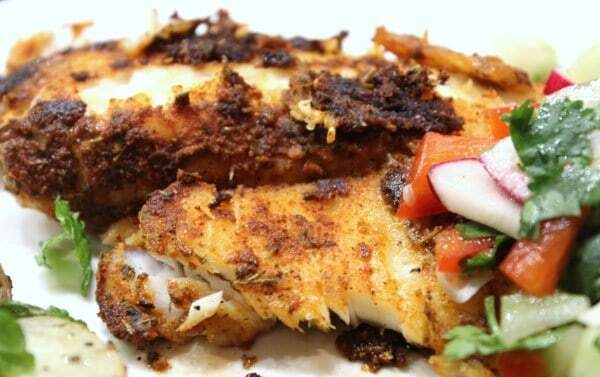 That blackened seasoning can sneak up on you!